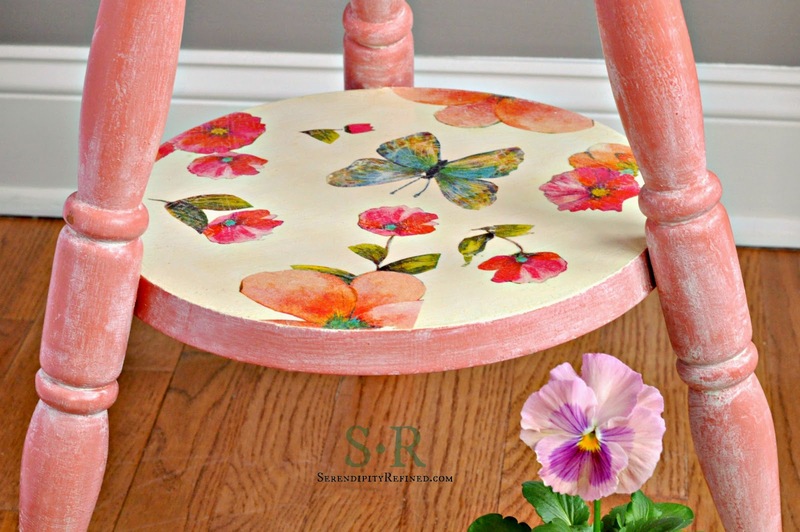 Today I'd like to show you a new way to use an old technique to brighten up painted furniture. 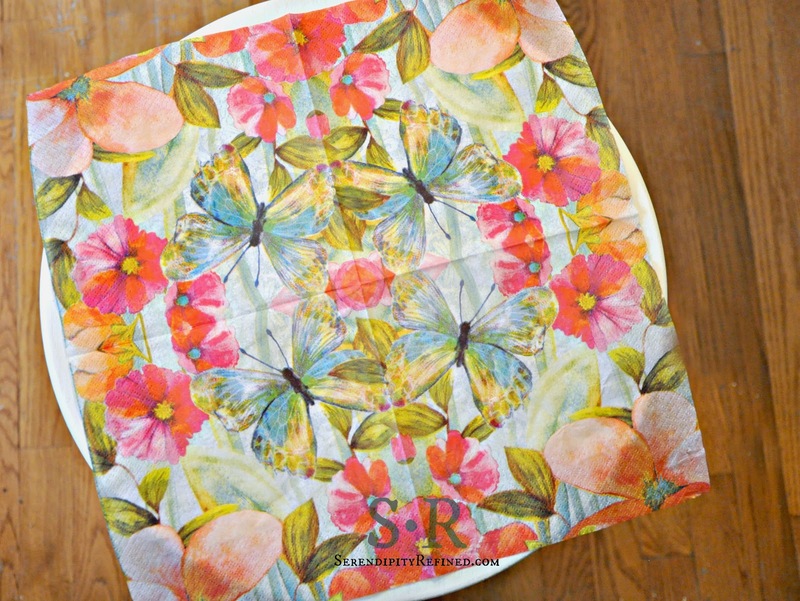 I used printed paper napkins as a part of the makeover for this customer piece. 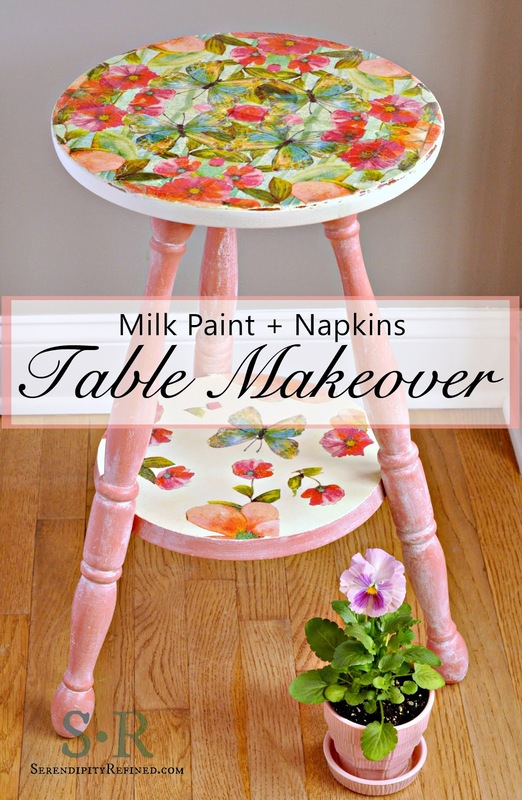 The flowers and butterflies on the Miss Mustard Seed milk paint table above are paper napkins which have been decoupaged onto the piece using Mod Podge. 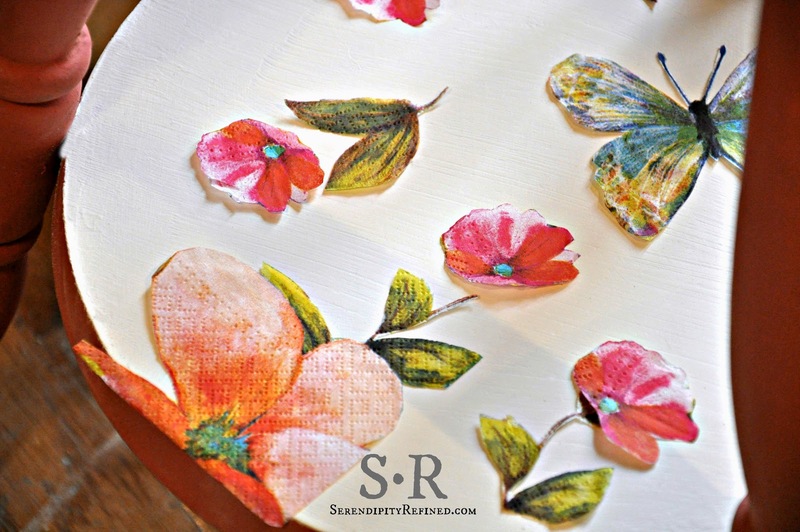 This technique also works well on wood trays, drawer fronts and cabinet tops so using a little imagination and a few simple paper napkins, anyone can create a one of a kind piece for just a few cents. 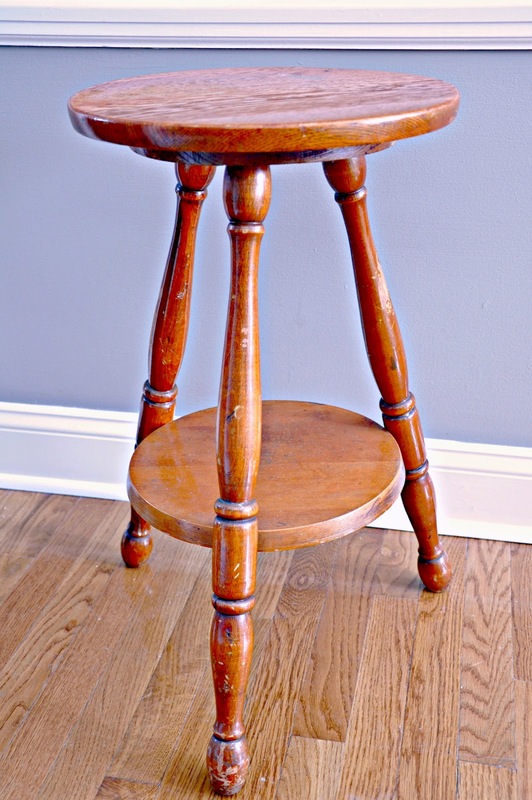 I started with this darling little table (or is it a stool?) that a customer brought to me for a makeover. 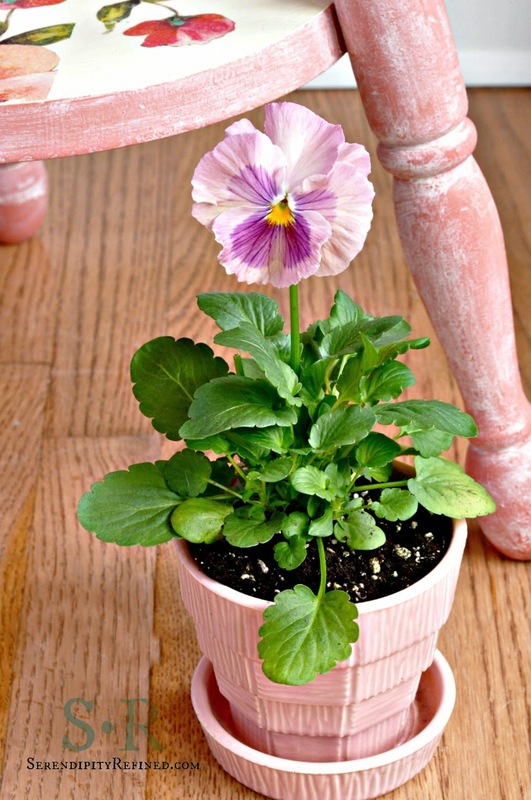 When she asked me for my opinion as to what color to paint it, I told her that the warmer weather had me longing to paint something in Miss Mustard Seed Milk Paint "Apron Strings" pink. Needless to say, when she agreed, I was tickled pink thrilled! 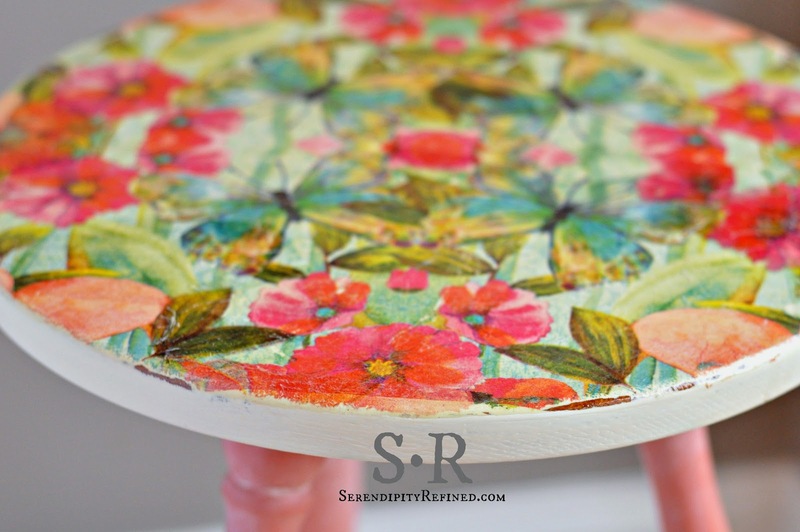 I began this makeover by sanding the piece with a medium grit sanding block and wiping the piece with a dry cloth to remove the dust. 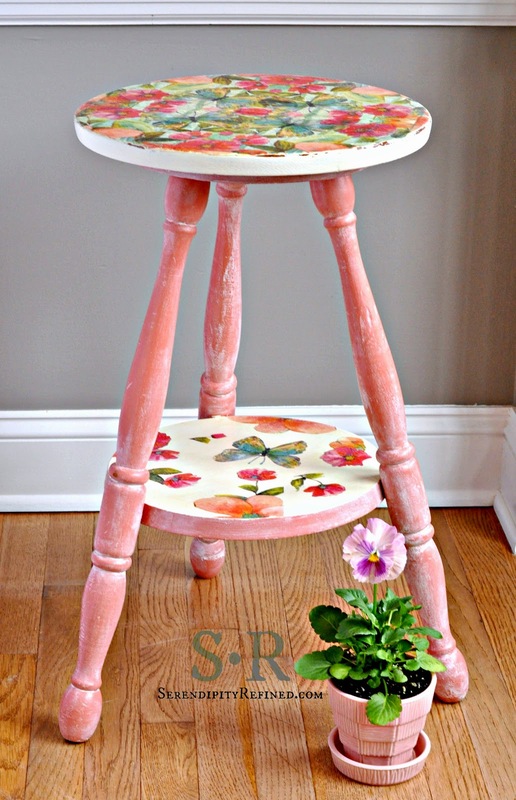 I painted the body of the piece with two coats of Miss Mustard Seed Milk Paint in "Apron Strings" mixed with bonding agent. The top of the piece and the top of the shelf were then painted with Miss Mustard Seed Milk Paint in "Ironstone" which I also mixed with bonding agent because I did not want a chippy finish on this piece. While the paint was drying, I carefully separated the layers on two paper napkins. As you can see from the photos above, the napkins that I used were three ply. This means that three were three very thin layers of paper which had been pressed together: one printed sheet and two white sheets. 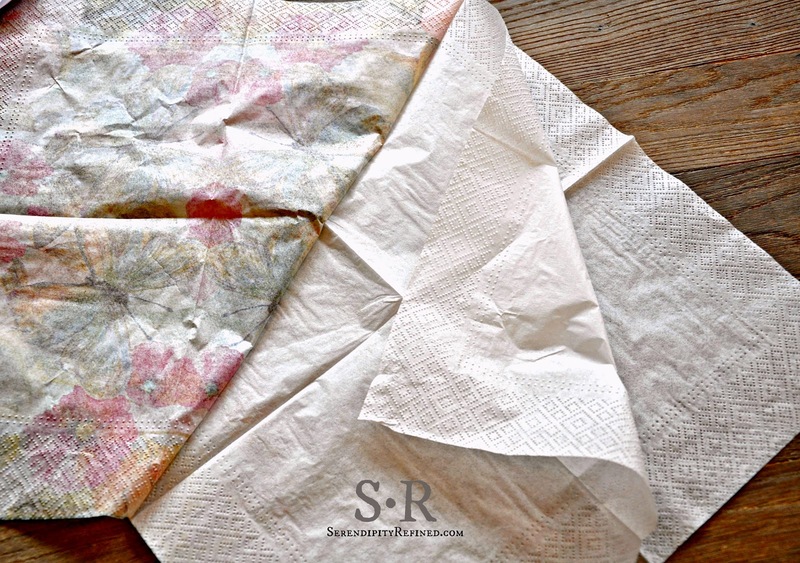 When using paper napkins in this way, I separate the layers for two reasons: first, it makes the napkin less noticeable on the surface of the piece to which is applied and second, it's much easier to sand. After separating the ply's, I cut single flowers and a butterfly for the lower shelf and arranged them in a pattern where some of the flowers hung past the edges of the piece. For the top, I used an entire single napkin. 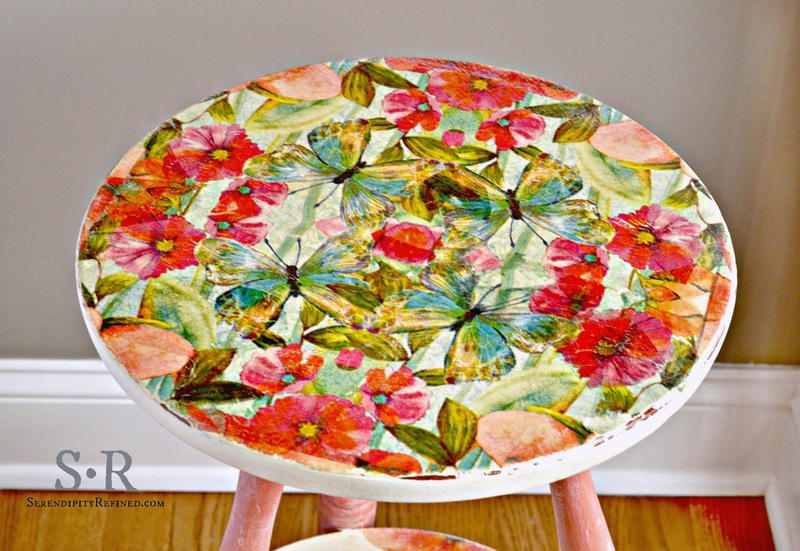 To attach the smaller pieces, I simply brushed small sections of the surface with Mod Podge in satin finish, carefully applied each individual flower and then covered the entire surface with a coat of Mod Podge and allowed it to dry. On the top, I laid out the napkin then, working from one edge, I folded the napkin back, painted a three inch wide band of Mod Podge and then placed the napkin over the band. 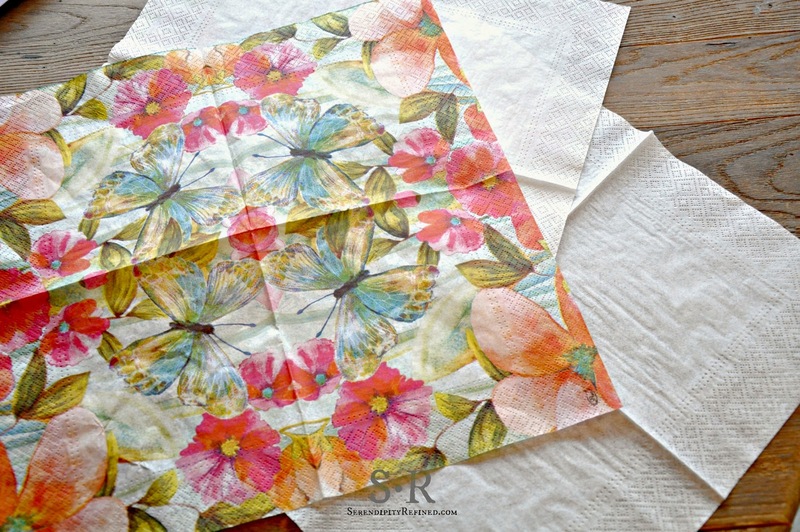 I then folded the napkin back from the other side and repeated the process across the entire top and coated the top with Mod Podge when finished. Since my napkin wasn't quite large enough, I added small pieces along the edges in some spots. Pieces of the square napkin hung over the edges in some spots as well. Don't worry. They are taken care of in the next step. When working with paper napkins, it's important to remember that they are extremely fragile when wet (which is why I don't have photos of the actual application process, the napkins would have fallen apart by the time I photographed them making it impossible to smooth them out) so brush carefully! It is also perfectly normal for the napkins to have small wrinkles in them. 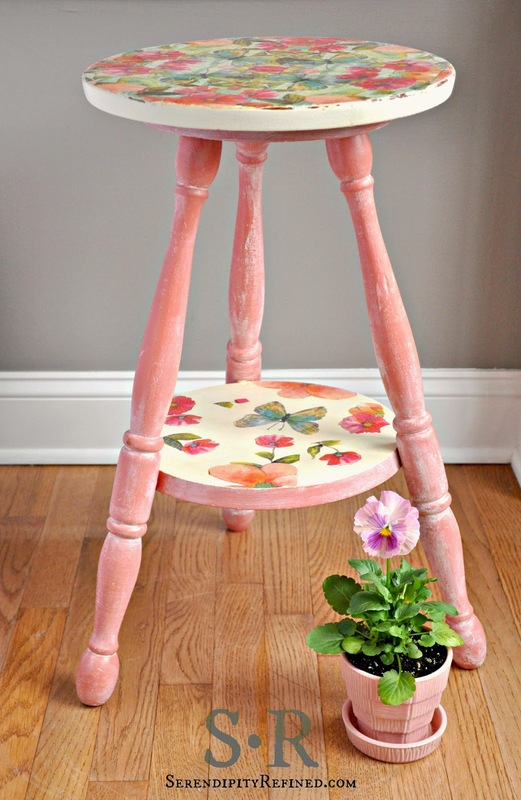 This adds to the character of the piece and looks great when distressed so don't worry. After the Mod Podge was dry, I removed the excess napkin by sanding the edges using a downward motion and a medium grit sanding sponge. 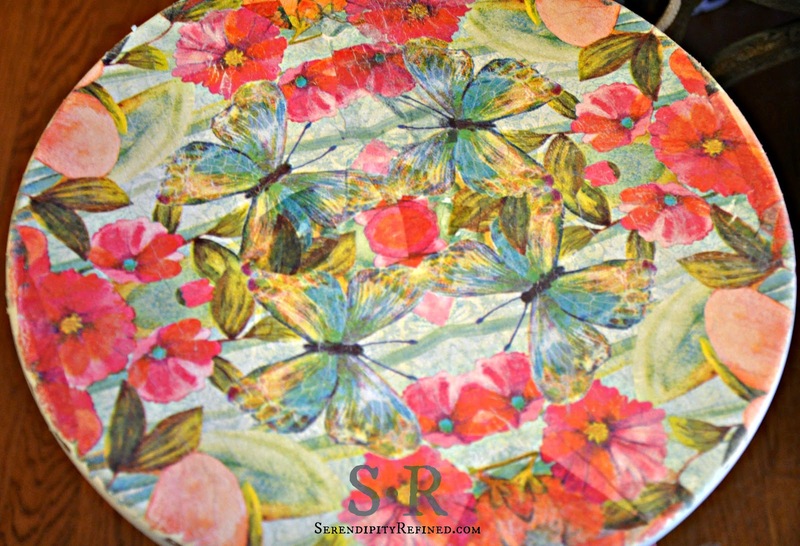 For a more distressed look, I use an electric sander and fine grit sand paper to remove large sections of the napkin and to give the piece an extremely vintage look which works well on larger pieces. Since this piece is small, I left most of the napkin intact and sanded lightly to remove some of the brightness and distress the piece only slightly. Finally, I waxed the body of the piece using Miss Mustard Seed White Wax and gave the top and the shelf a coat of clear satin polyurethane. The polyurethane does yellow the piece just a little but I didn't mind it on this particular piece. 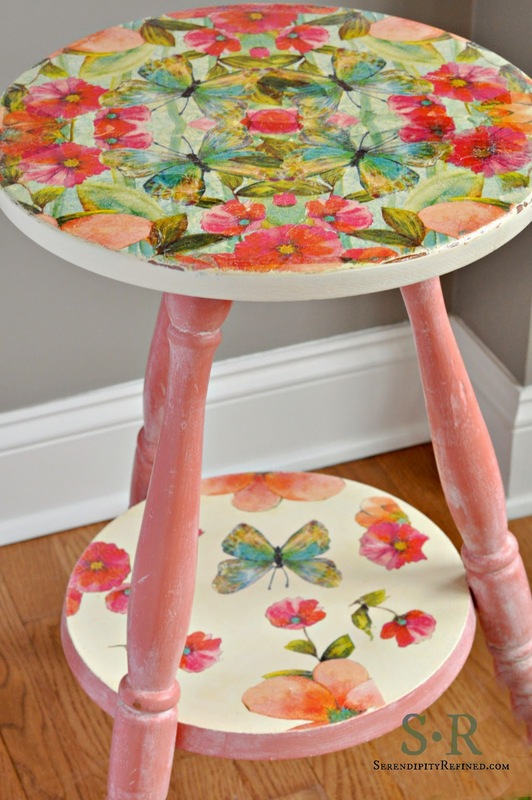 I really love how this little table turned from forgotten to unforgettable in just a couple of hours using about 1/2 cup of Miss Mustard Seed Apron Strings pink milk paint, a couple of tablespoons of MMS Ironstone white milk paint and two paper napkins decoupaged onto the piece with Mod Podge It's a darling little accent piece that will look great on a porch or covered patio or to bring some spring time happiness to any room!